The most powerful system monitoring app for macOS, right in your menubar. 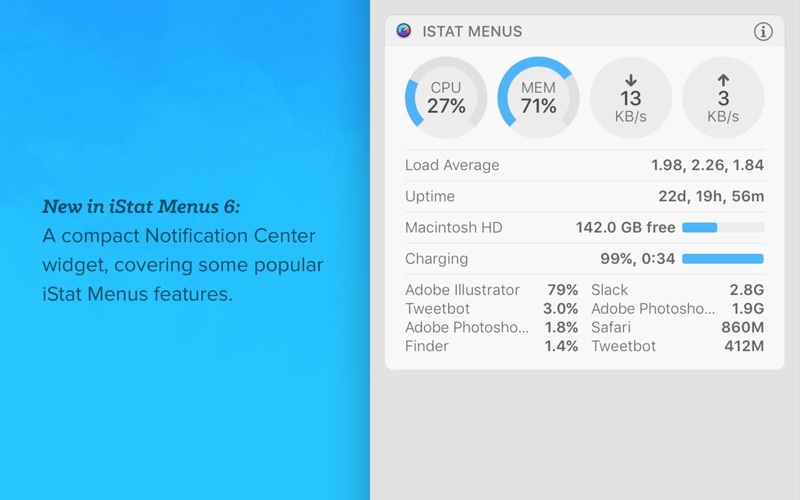 iStat Menus covers a huge range of stats, including a CPU monitor, GPU, memory, network usage, disk usage, disk activity, date & time, battery and more. All in a highly optimised, low resource package. 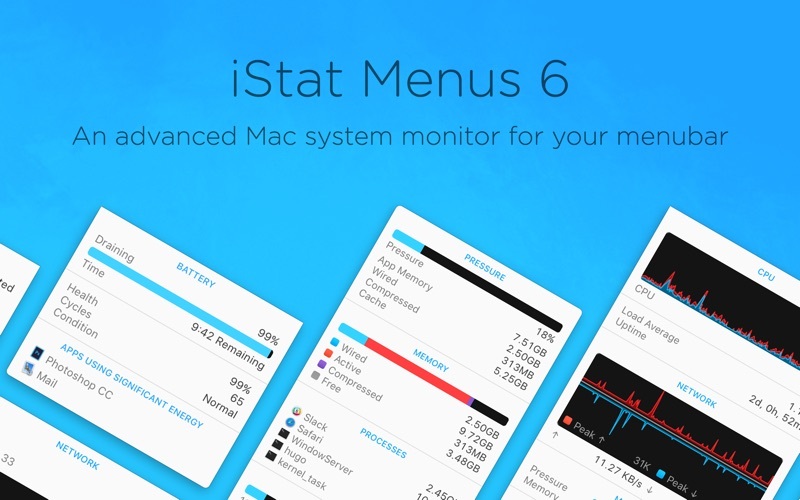 iStat Menus is highly configurable, with full support for macOS’ light and dark menubar modes. 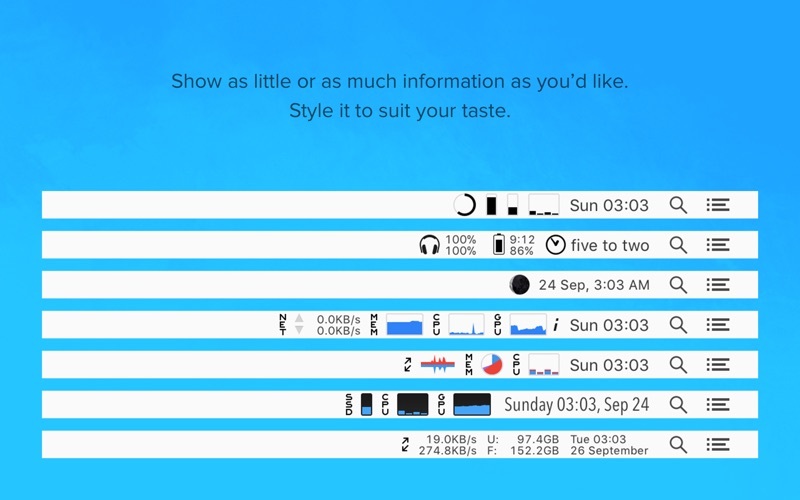 iStat Menus features a wide range of different menubar text and graph styles that are all completely customizable. Each of the dropdown menus provides access to even greater detail including history graphs for access to up to 30 days of data. Realtime CPU graphs and a list of the top 5 CPU resource hogs. Tracked use by individual cores or with all cores combined, to save space. 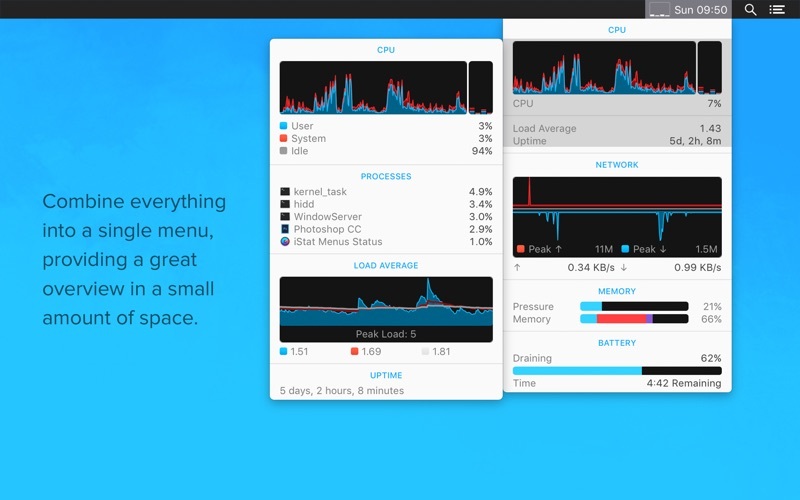 Plus, GPU memory and processor usage on supported Macs, and the active GPU can be shown in the menubar. Memory stats for your menubar as a pie chart, graph, percentage, bar or any combination of those things. Opening the menu shows a list of the apps using the most memory. Monitor bandwidth usage in the menubar as text or graphs. Advanced bandwidth and interface information is available in the dropdown menu. See used and free space for multiple disks in your menubar. Plus, S.M.A.R.T. status monitoring, detailed disk I/O, and a variety of different read and write indicators. A realtime view of temperatures, hard drive temperatures (where supported), fans, voltages, current and power. Please note that sensor monitoring requires installing a free add-on from our website. A highly configurable date, time and calendar for your menubar, including fuzzy clock, moon phase, and upcoming calendar events. Plus, a world clock with sunrise, sunset, moonrise and moonset times. Detailed info on your battery’s current state, and a highly configurable menu item that can change if you’re draining, charging, or completely charged. Magic Mouse, Magic Trackpad and Apple wireless keyboard battery levels. 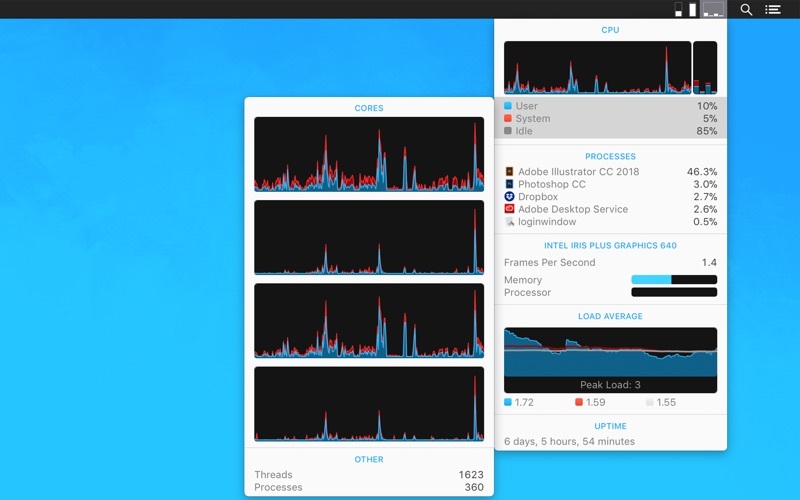 iStat Menus can notify you of an incredibly wide range of events, based on CPU, GPU, memory, disks, network, sensors, battery, power and more. This lets you be notified when your public IP has changed, if your internet connection is down, if CPU usage is above 60% for more than 10 seconds, or a near-infinite range of other options. It can even remind you of daylight saving changes.